This patch is in excellent condition and is 1.5" by 1.5". 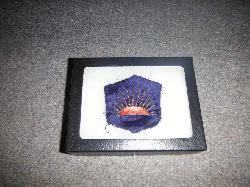 The background is purple (or faded blue) velvet with a gold colored bullion in the shape of a sun. The center of the sun is red cloth stitching to represent the sun and probably denoted artillery for the 41st. Excellent condition and a rare 41st ID patch.